Is on his best part the Ravello Festival, the music festival that for more than 50 years cheers the evening of Ravello, along the beautiful Amalfi Coast. 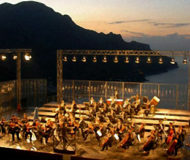 The event will be held until September 15, between the auditorium of the spectacular scenery of Ravello and Villa Rufolo. Concerts, about fifty, will see their climax with the highly anticipated performances by Ludovico Einaudi, Paolo Fresu, Ron, Gino Paoli and, of course, the various orchestral ensembles as the Orchestra Rossini of Pesaro, the Youth Orchestra of Palestine and the Kimbanguist Symphony Orchestra. Music for all tastes, but not only. This year, there will be plenty of space dedicated to dance – in this sense shall be notified the presence of the Étoile Eleonora Abbagnato. Finally, it is to be mentioned one of the most striking event, the Concert at Dawn of the night of San Lorenzo. The SymphonyOrchestra “Rossini” of Pesaro, directed by Amos Talmon, proposemusic by Mozart, Verdi, Rossini and Schubert. The event will start at 4.45 and will capture, thanks to the unique viewof Villa Rufolo, the best dawn rises, giving a performance ofunforgettable music and nature. All the details about Ravello Festival 2012 and its program can be found on the official web site. Description: Is on his best part the Ravello Festival, the music festival that for more than 50 years cheers the evening of Ravello, along the beautiful Amalfi Coast.